Coventry Viva! 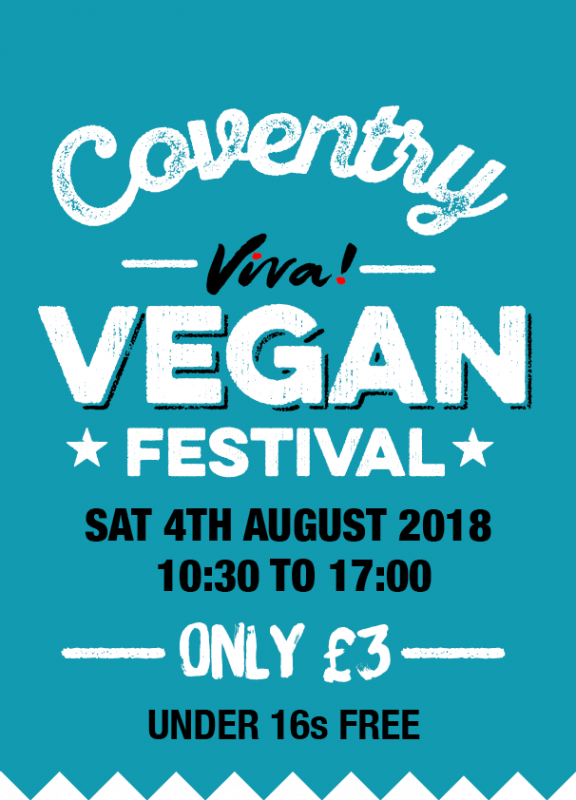 Vegan Festival - 4 AUGUST 2018 | Viva! Sat 4 August 2018 | 10:30 to 17:00 | Only £3 ON THE DOOR! Since 1994, Viva! has been campaigning to end the suffering of farmed animals. Viva! is positively vegan and helps people reduce their meat, fish, dairy and egg intake and move towards a kind, compassionate, healthy diet. We believe that every step towards being vegan is a positive one. Viva! Vegan Festivals were born out of the wish to equip people with all the info they need to change themselves or to bring about change in others. Our shows provide all the information anyone could ever want about going, being and staying vegan – or moving in that direction. We show people first-hand how animals are suffering in and how healthy and delicious a vegan diet actually is! We need a team of volunteers to help Viva! staff at the show so if you can spare a morning, afternoon or even the whole day, we'd love to hear from you. Tasks include welcoming (and counting) visitors, assisting with food tastings, washing up, leafleting, getting dressed up in an animal costume and getting visitors to complete our questionnaire. Thanks for a great day! Already looking forward to next year! Thank you for having us in Bristol on the weekend . We had an amazing time and we are happy with the outcome. Just left after being immersed in vegan foodie bliss! Heading home with a steaming vegan meaty pizza and lots of vegan cheese and egg replacements. Thank you Viva! for treating us all. ENTRY IS STILL AVAILABLE ON THE DOOR FOR JUST £3!